We haven't enjoyed a movie that much in a long time. Mithya (Fake) is such a refreshing change from anything else we could have possibly watched, it was like a brainwash. If the Italian film Johnny Stecchino and the Korean film Oldboy had a baby, it would be the strange and beautiful Mithya. Mithya inherits its plot from the former, but its aesthetics and dark sense of humor from the latter. Dressed in the guise of a bizarre gangster black comedy/noir, it's an unexpected meditation on identity which becomes increasingly labyrinthine in philosophy: is our hero Raje-bhai the crime lord? Or VK the struggling actor and loser? Does it matter anymore? Rajat Kapoor, the character actor from Monsoon Wedding, Jaane Tu... Ya Jaane Na and Krazzy 4 (off the top of our head), is apparently a wonderful director too, with a unique and gorgeous visual style akin in boldness to early Raj Kapoor. The aesthetics were truly mighty in this great little film. VK (Ranvir Shorey) is a struggling actor and all-round loser. He lives alone in his dingy flat, where he recites Hamlet in the mirror, he wears plastic pants in the rain and mutters to himself on the bus. Welcome to the dead end! One evening, after accidentally witnessing a brutal gang shoot-out, VK is stalked by a pair of henchmen (Vinay Pathak and Brijendra Kala) since - as his bad luck would have it - he is physically identical to their arch-nemesis, the Mumbai crime lord Raje-bhai (Ranvir Shorey, again). Eventually, VK is kidnapped by the rival gang - led by the grumbling Gavde (Naseeruddin Shah) and his buddy Shetty (Saurabh Shukla, who seems to be all over the PPCC these days!) - and engineered to take Raje-bhai's place. Their plan: assassinate Raje-bhai and plant VK as their mole. During VK's reluctant training in a remote beach-side house, he falls in love with Gavde's latest accessory, the sympathetic and sorrowful Sonam (Neha Dupia). That's all we'll tell you. Once VK manages to take Raje-bhai's place, the plot spirals in a whole new, unexpected direction. Our beloved Naseeruddin Shah and our newest fave, Ranvir Shorey. Whenever we see "crime comedy", we cringe. Yet Mithya is more of a black comedy in the manner of Pasqualino Settebellezze or even, say, Kill Bill. That is, it was violent, gritty and sinister - yet with an acerbic wit and occasional sweetness. Quite a feat to pull off! The whole vibe of the film reminded us of those Cannes-beloved European films: for example, its rapid pacing and sudden, vignette-style cuts (like, say, Gegen die Wand) and its gentle, pretty background score with contrasting tensions (like, say, La stanza del figlio). The acting was SUPREME, and the main role of VK/Raje-bhai seemed tailor-made for Ranvir Shorey, who was absolutely perfect. The role required a lot of range and depth, as we had to see and believe in two radically different men eventually merging into one, with all the pitfalls, doubts, hesitations and misunderstandings along the way. While some of these scenes were played for broad comedy (for example, when VK is hiding in Raje-bhai's bathroom), others were poignant (failing to recognize Sonam) or terrifying (VK's VKness slipping through). VK experiences some highs and many lows in this film, and Ranvir Shorey was both charismatic and naturalistic. If anything, we should note that this is the third Ranvir Shorey film we've seen - after Ugly aur Pagli and Aaja Nachle - where he plays a loser who is repeatedly beaten up, physically or spiritually or both. Is this becoming the brand? Hmm, too early for us to tell. But suffice to say, this role is the end-all, be-all lovable loser. Another thing Ranvir has been good at in every film we've watched: romancin' the ladies and winning over our heart! Everyone else is in top form: Neha Dhupia as Sonam was sweet, and her counterpart, Iravati R. Mayadev as Raje-bhai's wife, Revati, infused some unexpected depth into her scenes. It was both frightening and poignant to see Revati falling in love with her new Raje-bhai. 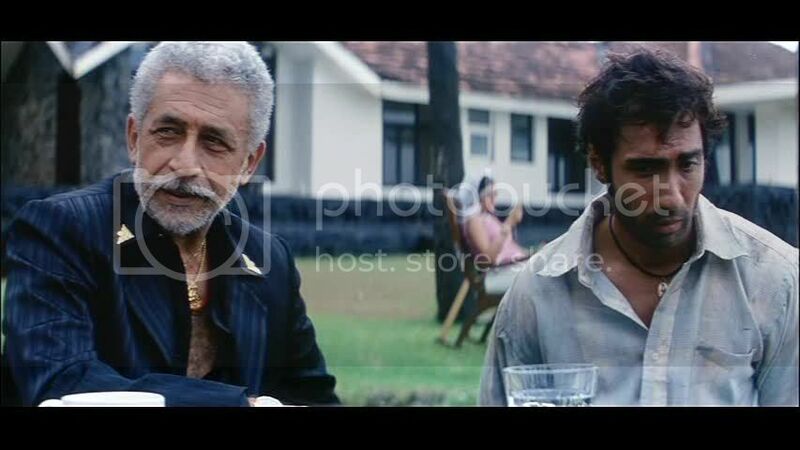 Naseeruddin Shah was his usual Naseeruddin Shah-ness, and his bickering with Saurabh Shukla was very endearing. Even more endearing were the bumbling, low-level goons played by Vinay Pathak and Brijendra Kala - these two were hilarious! And oddly sweet! They seemed so mischievous and vulnerable, such as when they make VK stand in a barrel of cement just to scare him, or when they and VK engage in a little power war in the beach house. 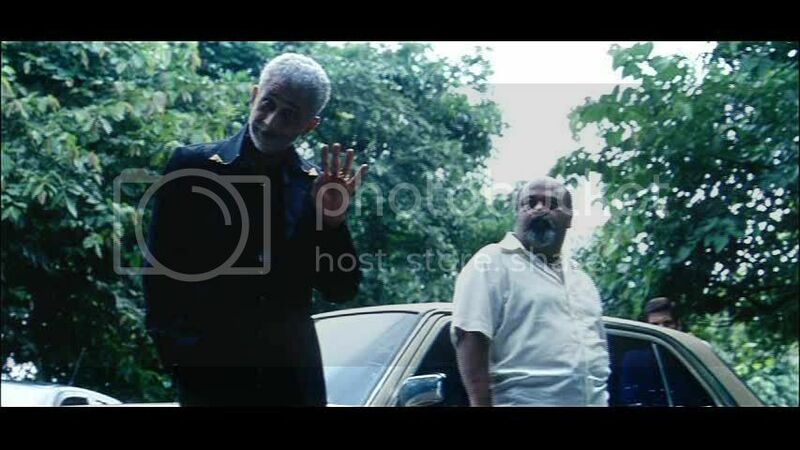 Naseeruddin Shah and Saurabh Shukla, who we may as well deem Dictator of the PPCC since he has literally been in EVERY SINGLE FILM we've watched this week. The bumbling, evil henchmen played by Vinay Pathak and Brijendra Kala - who was AMAZING - decide how to torment VK next. As we said earlier, the film is about identity - in particular, its malleability. The Philosophers' Magazine has a great game on personal identity called "Staying Alive" which investigates whether you define identity in terms of your body, your mind, or some hidden essence, like a soul or something. The game kills you off in a variety of ways, and all you have to do is remain internally consistent regarding which of you is YOU to survive. Mithya interestingly uses this same trope: various versions of Ranvir Shorey's characters - whether it's Raje-bhai, VK-as-Raje-bhai, VK-as-an-actor, VK-in-a-film-scene, and so on - are shot and, in the very end, while we know who Ranvir Shorey is playing, Ranvir Shorey's character has since become very confused as to who he actually is. There's also a funny little running joke when VK keeps jolting awake gasping, "My shooting!" Presumably, he's anxious about the film he's working on. But there's a heavy note of foreshadowing as well. Overall, this is NOT a typical Hindi film - it's neither commercial "Bollywood" (no songs, no happy ending), nor does it resemble the usual arthouse fare (no put-upon women, no farmers, no widows). That said, another very valid description of this film would be that it's your usual masala meal in a very special sauce. Indeed, several reviewers noted the similarities with that old masala classic Don. And in the second half, as VK's identity gets screwed up, there are a lot of genuinely heart-warming, masala-style moments where everyone is humanized, vulnerable and expressive. 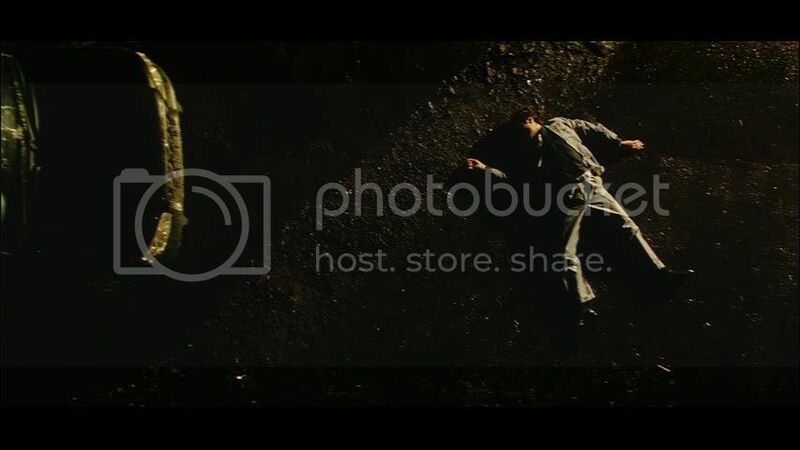 However the aesthetics of the film seem to be much more surreal, hipster and edgy. *toot! * Ranvir Shorey time has hereby commenced at the PPCC. We want to see more weird and grimy tales from this guy, as he's clearly all that and a bag of chips! No Smoking is definitely next, and we remember reading about him playing a heroin addict on Paisa Vasool somewhere? What else, PPCC readers? We need your help! Hamko aapka madad chahiye! OOh, if you're planning on No Smoking, does that mean you might do Dev D as well? Playing now! Amrita - Arrghhh, except here! I'll have to start scrounging around the DVDwallahs, who somehow manage to get some of these films that don't release in theaters. I REALLY want to see it! Have you seen Khosla Ka Ghosla yet?! Try that one, too. I haven't seen Bheja Fry yet but that one is supposed to be good, as well. And Re: Vinay Pathak, I just saw him in Manorama Six Feet Under and he could have quite the career as a filmi "heavy." Lastly, have you seen Waisa Bhi Hota Hai Part II starring Filmi Girl fave Arshad Warsi? It's a gangster comedy done in a very off-beat way. I'd love to know your take on it! PS RANVIR SHOREY! ANIL KAPOOR! They both manage to stradle off-beat and commercial cinema so well. Haha, just noticed I put heroin with an "e" added. Perhaps I should've been referring to Ram Gopal Varma instead? Another off-beat movie with Ranvir is "Freaky Chakra" It's a bit odd, but pretty interesting. Shweta - Just saw bits of Dasvedaniya - what a mullet! I've been meaning to see Honeymoon Travels (Boman! Shabana! ), this might just spur me to check it out. Filmi Girl - Just watched No Smoking and my BRAIN FELL OUT. But yes, I can objectively say that it's fab! Thanks for the recommendations too!! Filmi Girl2 - OMG YES! 'TIS THE SEASON, it seems, for off-beat, quirky heroes! I've decided to write a movie for Ranvir Shorey where he plays a failed kendo instructor-turned-underworld goonda. WIN! Ajnabi - Thanks for the rec! Heqit - Awww, poor Anil. I confessed to a friend today that I've decided to DROP Aneel Kaporre until he deflates from all the Hollywood adventures. I said that... and then I found an Anil/Madz movie at the DVDwallahs and CAVED. So here ends my 30 hour Anil-free period. Thanks for the ref! I told Uncle DVDji to dig out Khosla as well! I too recently learned Saurabh Shukla's name, and doing so filled me with real satisfaction of being able to say something more specific than "Oh, that guy." I loooove Honeymoon Travels despite not having watched it yet. It's one of the very few movies I saw, then bought - usually I buy movies in order to see them. PPCC should try Being Cyrus, which was probably the first Hindi black comedy I saw. Prior to Bollywood, black was my favorite color of comedy, and comedy my favorite type of film, and I am always glad to know of Hindi examples. Oh! And try Rajat Kapoor's Raghu Romeo, which stars the equally was-great-in-Monsoon-Wedding Vijay Raaz. And Saurabh Shukla. I thought the movie was a little uneven but still funny. Memsaab - Honeymoon and Waisa coming up! No Smoking might be a good watchalong movie, as it's just SO FREAKY. I know I'll need company if I watch it again. Beth - Ooh, all those black comedy recs, thank you! I remember seeing some of Being Cyrus - it might have been my second or third Hindi film - but I didn't like it because I'm a stinking Orientalist and the English felt strange to me. I'll try to get over my prejudices and watch it again! Brian - Aww, poor Aneel. He's going to be reappearing on the PPCC soon... just found a long-lost crackfest Anil/Madz movie, yahoo! I'm lovin' Ranvir at the moment as well, but, alas, he just hasn't made as many films as Anil yet. And you know what counts at the PPCC: QUANTITY! Being a Ranvir fan myself, I'd suggest watching Traffic Signal. He is not the main role, but his role is simply amazing. He does it so well. Although, it does go along the lines of the loserish personality.